The runway has been dusted off and the last hem has been stitched. Western Canada Fashion Week launched its fall 2011 season last night by giving the city's unknown designers a rare chance to prove their talents in the spotlight of Edmonton's biggest fashion event. Ten MC College Fashion Design graduates presented their first, full collections - putting everything they've learned in the past year at centre stage in front of all their peers and Edmonton's fashion community. Before their big moment on the runway, I sat in on two students' fittings and gathered their pre-show feelings about the experience. "Fool of a Cello" collection by Nicole Campre, Photo courtesy of MC College Edmonton. Nicole delicately shows me a few pieces from her "Fool of a Cello" collection. Her humble demeanor is uncalled for as her designs are not only elegant, structured and rich in fabric, but actually wearable. Nicole describes the collection as "inspired by the momentous musical movement of the Baroque Era with cello-inspired silhouettes and ornate fabrics." Her fabric choices are impeccable and incredibly mature. I gushed over a sophisticated dress with shimmering gold fabrics and admired the young designer for her vision and couldn't help but think how nervous she must be to present her blood, sweat and tears for the first time. "I don't have a single once of nerves in me at this moment.... I'm excited!" says Nicole when asked how she's feeling about presenting her collection, "I just hope my clothes will be as inspiring to the audience as my design concept is to me." "I don’t think Sandra [Sing Fernandes, Creative Director of Western Canada Fashion Week] can even comprehend how much she’s moving Edmonton forward with fashion. It’s such an exciting time to be a designer right now with all the talented emerging designers, photographers, writers and bloggers. It’s amazing!" Nicole's garments display natural talent and vision, but she gives credit to MC College for all the skills that have led up to this moment. "Besides the technical and industry knowledge, I feel I’ve learnt so much about myself [In the MC College Fashion Design Program]. The program is so rich, intense and fast, it really tests who you are as a designer and where you want to be. What I got out of it as an individual, is to always be yourself and don’t be afraid to stand up for what you believe in. You only have one year at MC, make it the best possible." And Nicole's advice for those interested in entering the world of fashion design? "The same advice I’d give anyone who’s interested in anything: Believe in yourself, trust your dreams and sleep when you’re dead." MC College graduate and designer, Arlee Stewart, beaming after showing her collection last night at Western Canada Fashion Week. Charming and polite, Arlee looks the part of a designer. Tall and confident with a chic, platinum blonde pixie cut, her designs show maturity well beyond her years. She describes her collection as "An edgy way of revolutionizing classic fabrics and silhouettes, inspired by the elegant Parisian look and the definitive style first introduced by Chanel." Out of all the students Arlee seems the most enthusiastic. She can't stop smiling, even though - looking at all the details and structure of her garments - she must be exhausted. "Marvel College has been quite the experience. You definitely learn the dedication it takes to be in this industry. The amount of coffee and all-nighters this past year was an eye-opener, but the knowledge you gain is amazing. I learned so much this year and my teachers were really dedicated to helping us so it made the program worthwhile." "It's all quite stressful, but I am extremely excited to show Edmonton my collection! 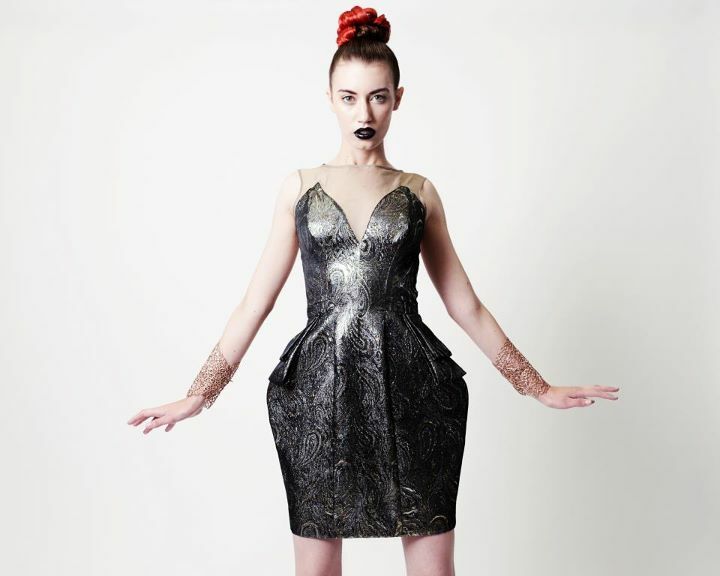 Western Canada Fashion Week gives new and young designers like myself, a jump start into the fashion industry that is so hard to come by." And where does she hope this jump start will lead? "In 5 years I would like to have my own brand developed and expanded across Canada. Fashion illustration is also a huge interest of mine, so anything related to that would be amazing to pursue." 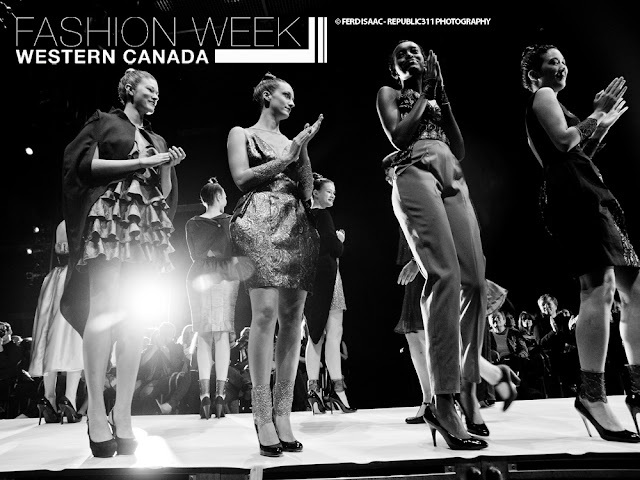 Click here for more photos from opening night of Western Canada Fashion Week.